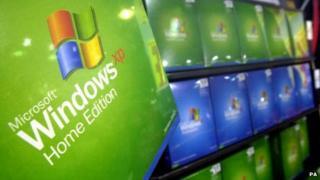 Microsoft has decided to continue providing virus warnings for the ageing Windows XP operating system until 2015. The warnings were due to end on 8 April 2014 when all other support for the software is scheduled to stop. However, the numbers still running the 12-year-old operating system convinced it to provide more help. About 30% of all desktop computers are still running XP, according to figures from research firm Net Applications. Microsoft explained its change of policy in a blogpost saying the feed of security information was the only support XP users would receive after 8 April this year. This would mean that it continued to provide signatures for well-known malicious programs that will help Windows XP spot when viruses, trojans and other cyber-threats try to compromise a PC. The malware-spotting updates will be provided for Microsoft's Security Essentials and for a wide variety of corporate tools used to protect large numbers of PCs. These security updates will be produced until 14 July, 2015. However, security patches, regular updates and bug fixes for XP will stop as scheduled on 8 April. In its blogpost, Microsoft warned users to stop using XP to ensure they stay safe. "The effectiveness of anti-malware solutions on out-of-support operating systems is limited," said Microsoft. "Running a well-protected solution starts with using modern software and hardware designed to help protect against today's threat landscape." Despite its age, Windows XP has proved to have a long life on desktops in homes and businesses. This led Microsoft to keep selling it long past the date it was due to be removed from shop shelves. This longevity is partly because of the poor reception that its successor Windows Vista received and because some businesses have found it hard to adapt to the changes introduced in Windows 7 and 8.